On-loan Walsall striker Jordy Hiwula says the club face two "must-win games" at home if they are to claim automatic promotion from League One. Hiwula, 21, scored in the Saddlers' 2-1 victory at Gillingham that closed the gap on second-placed Burton Albion to five points, with a game in hand. 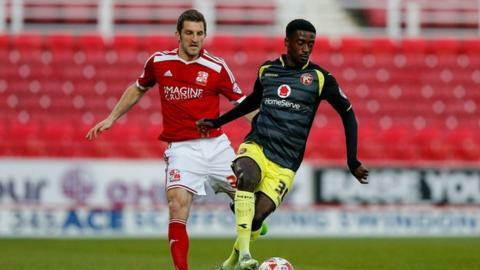 And with Southend and Swindon up next at the Banks's Stadium, Hiwula says they cannot afford to lose. "We've got to keep winning and hope Burton slip up," he told BBC WM. Former Manchester City trainee Hiwula is in his second spell with Walsall, having scored nine goals in 20 appearances for them last season. He was loaned out to League One leaders Wigan immediately after signing for Huddersfield from City last summer. Now back in the West Midlands until the end of the campaign, Hiwula is determined to help the Saddlers into the Championship. "We've got one of the best away records in the league and we need to keep going and take that into the next two games at home," he added. "They're two big games - must win games - and we need to take it to our opponents."